Nintendo safety warning for young children using 3D games | It-11 Audio / Tonegeek"
Nintendo Japan has issued a safety alert on its website : potential hazards to view 3D images on its future 3DS handheld for young children (under 6) : “Vision of children under six years has been said to be in the stage of development”. 3D is delivered left and right eye images different, the viewchildren under 6 could be affected as their view is still under development. The post, which comes ahead of the launch of his at CES 2011, suggests that parents set up Parental Controls to restrict young children displayContent on 3DS only in 2D. Children under 6 years who considerconsole at CES 2011, would have prohibited the use 3DSevent. 3D games which are scheduled to be exhibited alongside include 3DSMetal Gear Solid Snake Eater 3D Sample Naked, Winning Eleven3DSoccer, Street Fighter IV and Resident Evil Edition 3D among others. 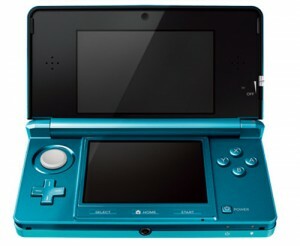 Nintendo plans to launch the 3DS Japan on February 26 forequivalent of $ 300. This entry was posted in What's up, doc ? and tagged 3D, 3DS, children, nintendo, warning. Bookmark the permalink.